Just before the 2015 Davos Summit being held in Switzerland this week, the charity Oxfam has published details of how the mega-rich 1% now own and control more than half of the world’s wealth. This miniscule group now have cornered more wealth than 99% of world’s population as a whole have. “This is one of the worst psychological states of mind for human beings. We see quiet desperation spreading among Europeans, resulting in depression, resignation and loss of hope,” says a 2013 report from the International Federation of Red Cross and Red Crescent Societies. “Whilst other continents successfully reduce poverty, Europe adds to it. The long-term consequences of this crisis have yet to surface. The problems caused will be felt for decades even if the economy turns for the better in the near future … We wonder if we as a continent really understand what has hit us,” the report ponders. 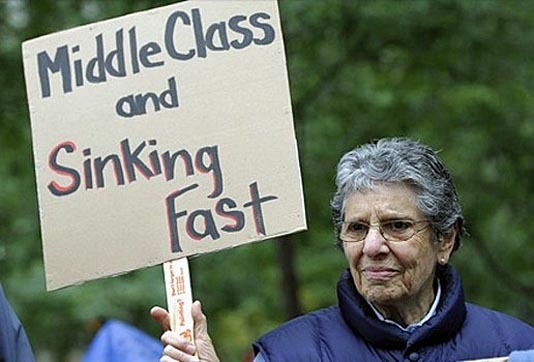 According to Germany’s Bertelsmann Foundation some 5.5 million Germans have lost their middle-class social status over the past decade and fallen into the ranks of low-income earners while at the same time half a million others made the grade as high-income earners. Despite Germany’s vaunted success in avoiding the high levels of unemployment prevalent across much of the EU, a quarter of the country’s employed are classified as low-wage earners, almost half of new job contracts since 2008 have been low-paid, flexible, part-time so-called mini-jobs/zero hours jobs with little security and usually no social benefits, The Guardian reports. PROUT’s middle class, on the other hand, is not defined by people who perform intellectual (non-menial) work, or of people of average wealth (neither super-rich nor poor). The critical middle class in a capitalist society consists of warrior-minded and intellectual people who refuse to accept capitalism as their life ethos. Instead they choose to work for the introduction of economic democracy focussed on humane cooperation and all-round progress for all. PROUT’s concept of middle class springs out of the theory of the social cycle. The social cycle spans four classes — workers, warriors, intellectual, and acquisitors (capitalists) — who dominate their respective eras and times. During capitalism, the three other classes are subjected to working round the clock for the continuous enrichment of the minority rich. It is this situation we see today: the 99% and the 1%. Of the 99% the majority are of worker mentality, understanding or knowing little beyond slaving for their exploitative employers. Only a small minority of the 99% hold on to their original warrior and intellectual values that enable them to see beyond capitalist rule and cherish the vision of a new human society where all can progress. The difference between PROUT’s concept of the middle class and the conventional capitalist view of it reflects a deeper view of human nature and potentialities. PROUT is for maximum utilisation and rational distribution of all physical, mental and spiritual potentialities, both of the individual and the collective.